Figure 1. Bearish Doji Star pattern. This article is devoted to the Bearish Doji Star two-line pattern. The first line of Bearish Doji Star has to be a white candle appearing as a long line (White Candle, Long White Candle, White Marubozu, Opening White Marubozu or Closing White Marubozu). The following candle is any doji candle, except the Four-Price Doji. The doji's body is located above the previous candle's body. Length of the doji shadows does not matter. The Bearish Doji Star appears in an uptrend and belongs to the bearish reversal patterns group. Its occurrence should be confirmed on the following candles. This pattern is distinguished by a gap between the first candle's high and the following candle's low or between bodies of these two candles. First confirmation is when the gap is covered on the candle following pattern. It can be a black candle which body is located wholly below the doji's body. Other, stronger type of confirmation, is when an uptrend line or a support zone gets broken. Figure 2. A Bearish Doji Star pattern is formed just below the resistance zones created by the occurrences of Black Candles (numbered from 1 to 3). The second line of the pattern is a Northern Doji pattern. Prior the Bearish Doji Star occurrence, a resistance zone is created by the White Candle (1), Rising Window and White Candle (2) being the first line of the pattern. In order to confirm the Bearish Doji Star, White Candle (2) has to be covered. The example shows how patterns confirmation is essential. Although the pattern's appearance looks promising, the market tries to move up and to break a resistance zone formed by the Black Candle (2). The second occurrence of the Northern Doji is not a part of a Bearish Doji Star, because the first line is a White Spinning Top, whereas a white candle appearing as a long line (White Candle, Long White Candle, White Marubozu, Opening White Marubozu or Closing White Marubozu) is required. Figure 3. Yet another chart showing how patterns confirmation is crucial. The first line of a Bearish Doji Star is a Long White Candle. It is formed at a significantly higher trading volume, creating a support zone (at this moment it is not known, that soon a bearish reversal pattern will appear). 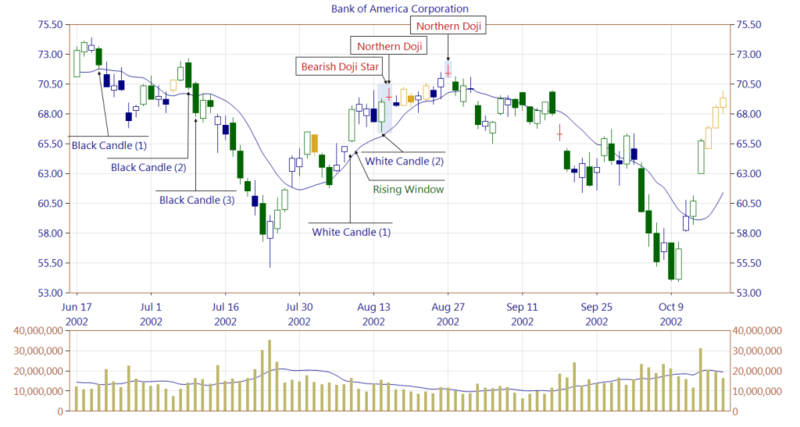 The following candle is a doji candle, which together with the Long White Candle develops a Bearish Doji Star pattern. Problem of this pattern occurrence is that its first line is a very bullish Long White Candle which has to be covered, in order to treat the pattern as confirmed. 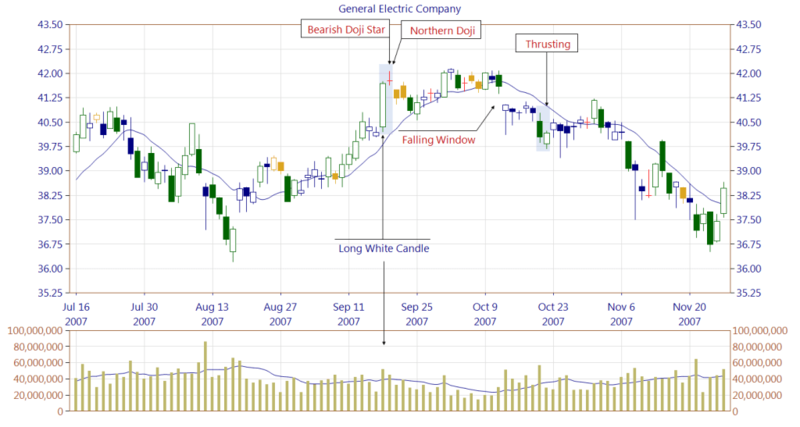 Indeed, the Long White Candle is very powerful, and the market moved sideways for four weeks. Then the occurrence of Falling Window, proved by the Thrusting pattern reversed the uptrend to the downtrend. Figure 4. An occurrence of Rising Window (forming a support zone) beats the resistance region created by three Black Candles. It seems that the market will go up, however then the Bearish Doji Star pattern appears. The candle following the patterns looks still bullish. However, it turns out that it is a first line of the Turn Down pattern. The bears have a tough job now, as on their way strong support zones emerge (Rising Window pattern and white candles). 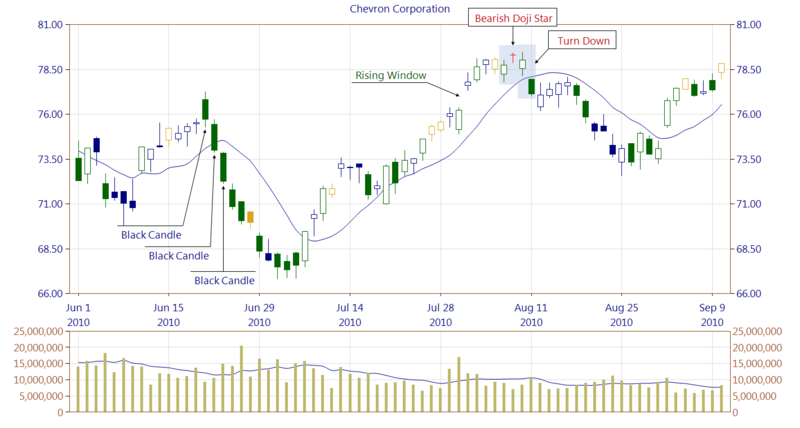 Below you can find some Bearish Doji Star pattern statistics calculated by CandleScanner software. To see more detailed statistics, for other markets and periodicity try our CandleScanner software. Prices start at only $99, and you can see more detailed statistics, for other markets and periodicity. Click here to find out more!